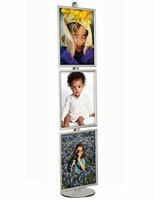 Snap Frames : This tall display stand is 8 feet tall! Towering Display at 8 Feet Tall! 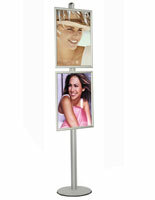 This tall display stand delivers advertising results! This tall display model is stylish and modern with a uniquely European Design. The tall poster stand includes two snap open poster frames that are separately height adjustable along the 8 ft tall display stand pole. 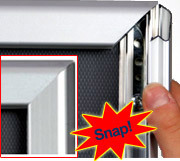 Additionally, the two snap frames can both be set on the same side, or back to back! 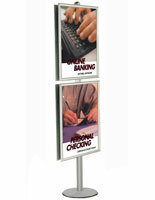 This tall display stand is 94" tall, towering over most other poster displays. This tall stand is commonly seen in large indoor venues with busy pedestrian activity, such as large retail stores, visitor centers, transportation entryways or building lobbies. 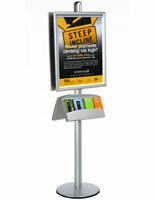 Tall display stands can be used to display all sorts of advertisements. This sturdy snap frame will stand out, and comes at a great price! The snap open poster holders are easy to use and are front loading. Simply snap open all four frame sides, place your 24"w x 36"h poster inside, lay the clear plastic lens on top and snap it closed. The poster frames are attached and height adjusted using the simple channel attachment screws that are provided. There is a layer of rubber around the base to protect flooring surfaces from scratches. This tall display stand ships unassembled and is easily assembled with the provided instructions.